This is a pretty common theme….obsession with boots. I don’t really live in a region where boots can be worn the majority of the year, but I still love them. And if truth be told, they’re a little bit like black shoes. One pair is never enough and more often than not, there are only slight differentiating factors. 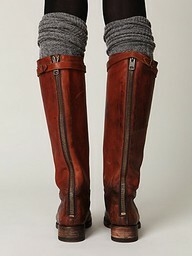 What I mean is that to the untrained eye, the boots I’m obsessed with look pretty similar to boots I already own. I’ve refrained from posting a picture because I’m pretty sure my husband will agree with this theory. I can’t stand it anymore. I MUST LET EVERYONE KNOW ABOUT MY OBSESSION. They come in black too…. Apparently, I’m not the only one obsessed. They are almost sold out in my size. Meanwhile I wait because I’m saving up for these boots instead of buying them on credit. Darn you Dave Ramsey. This entry was posted in Things to buy, Today's Obsession. Bookmark the permalink.